What happens when we see ourselves as separate from or as a part of nature? We evolved within the community of life, and yet we humans often consider ourselves separate from nature. Are we unique? Is this distinction helpful? How do our ways of thinking of ourselves in relation to other life influence the identities we carry and actions we take? 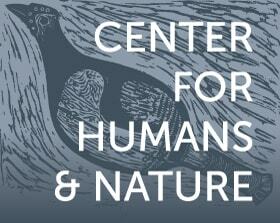 We invite you to share your reflections as we explore the relationship between humans and nature. Read a story, tell your own. This series is a partnership with students from Loyola University Chicago's Institute of Environmental Sustainability. In American culture we fall on the side of seeing ourselves as separate from nature. In my personal life I have noticed that the older I get, the more I become separate from nature. As a young child, I had a strong connection to nature. I grew up in the county where I would spend the majority of my day outside. As I grew older I increasingly became shaped by the cultural idea in America of seeing ourselves as separate from nature. This shift to adopting the social norms of America has separated me from nature even more. When we begin to separate ourselves from nature, we start to overlook the consequences our actions have upon the Earth. When this happens it becomes very easy for us to do what is easy or convenient for us in the present moment than what has the least amount of consequences on the Earth. For example, most of us use our cars every day to transport us where we need to go even if by doing this we are polluting the air with exhaust from our cars. We do this because it is most convenient for us and takes less time and effort then riding your bike everywhere. We choose this convenience because on some level we have separated ourselves from nature. As a result of this separation, we have a tendency in our American culture to value the good of humankind over the good of nature. In our culture we do not think of nature as being very important. We tend to care more about what is happening in the news or on social media. We have the idea that nature can care and fix itself. Separating ourselves from nature can also make us indifferent to large scale environmental problems like global warming. What I mean by this is, most people will agree that global warming is bad and something needs to be done to stop it, but we are not willing to give up modern conveniences in our lives to actively fight it. This is because, while global warming does affect us greatly, it does not affect us greatly on a day to day level. This makes it very easy for us to talk about changing our lifestyles to be more environmentally conscious but a lot harder to adopt these lifestyle changes in our daily lives. The root of this separation between ourselves and nature comes from the way we see nature in our culture. In our culture we live in houses to separate us from nature. We use air conditioning and heating to make nature more comfortable. We have supermarkets so that we do not have to grow our own food. We drive cars, fly in planes, and build roads to make it easier to traverse through nature. All of these things separate us from nature by allowing us to spend less time interacting with nature and more time thinking about what we need as an individual. This mindset in our culture of thinking about what you as an individual need can be very damaging to our environment. It is damaging because people tend to put their own personal needs above the potential consequences that their actions might have. When it comes to America our culture falls heavily toward the side of separation from nature rather than being a part of nature. Because we are separated from nature we tend to neglect and mistreat it because it is hard for us to see the long-term negative effects that our actions have. It is also hard for us to become more of a part of nature because we are reluctant to let go of our modern conveniences.